Last weekend I took a road trip to Winona with my fellow Twin Cities Theater Bloggers, Laura from Twin Cities Stages and Julie and Carol from Minnesota Theater Love. It was my first visit to the Great River Shakespeare Festival, which is celebrating its 15th anniversary season this year. I had a great experience, and it will definitely not be my last trip to Winona. Not only is the theater entertaining, engaging, relevant, and well done, but the festival is well organized and provides many other opportunities for entertainment and engagement throughout the charming river town of Winona. A theater festival is a pretty unique experience in the state of Minnesota, one I didn't even realize I was missing. GRSF runs through August 5 so there's still time for a road trip theater vacation this summer. What's better than that?! "But Cherry and Spoon, why should I drive 100 miles each way to see a play when there's so much great theater right here where I live?" I'm glad you asked, dear reader. Because a theater festival is not just about seeing a play, it's about the greater experience that a theater festival offers. A theater festival allows you to see a company of actors performing several different plays in rep, which doesn't happen often anywhere else. So you get to see the same actor play several different parts in different stories, exploring a wider range than one role typically allows. And when the plays are well chosen (as they are here), they all relate to each other in ways obvious or not so obvious. The fun of a theater festival is when you begin to see similar themes emerging in the seemingly very different plays, in observing how they speak to each other, in making connections. And the best part of a theater festival that's 100 miles away is that it forces you to leave your daily life behind and immerse yourself in theater, in the community of people coming together to make and experience art, and in all of the extra fun activities that are offered. At GRSF, the extra fun activities are many. There are some fun one-time events like the 28 furlong race called the Will Run, around beautiful Lake Winona, and the festival closing celebration. Regular events include free outdoor concerts before every performance, on the lovely green space right outside the Winona State University performing arts center, along with a food truck and beer and wine garden. Every Saturday morning there's a "Front Porch" talk on various topics in theater, as well as "Company Conversations," more informal discussions with company members. We really lucked out on the conversation that happened last weekend and got to learn about Intimacy Choreography. Yes, it's a thing, and a very important thing. The guest speaker was Tonia Sina, co-founder of Intimacy Directors International, who also led a workshop for theater professionals on this new and growing field. In a nutshell, Tonia and her company advocate treating intimacy scenes on stage like fight scenes, which often requires bringing in a consultant who's trained in the area. Trained to make sure that the actors feel safe, that the intimacy tells the story, and that it looks good for the audience. She teaches five pillars to achieve this: context, communication, consent, choreography, closure. I'm not a theater artist, so what I found most interesting from an audience perspective is that when intimacy looks awkward and uncomfortable on stage, it's most likely because the actors don't feel safe, or comfortable, or in control of what's happening with their body. And that's no fun for anyone. This is such important work, and everything Tonia said makes so much sense, that I can't imagine Intimacy Directors won't be as common as Fight Directors in a few years. I urge all theater artists to check out the great information on the Intimacy Directors International website, and watch for more on this topic, and hopefully more workshops in the future in the Twin Cities area. Oh yeah, I saw some plays too! Unfortunately I was not able to see all four plays in the two days I was there, so I missed All's Well That Ends Well (for more on that one, please visit Minnesota Theater Love to read Julie and Carol's thoughts). Three of the four plays are presented in the mainstage theater, sharing a few common elements of set design (a raised mini-stage at the back of the stage and wooden arches, all mainstage set design by R. Eric Stone), and one takes place in the black box theater. 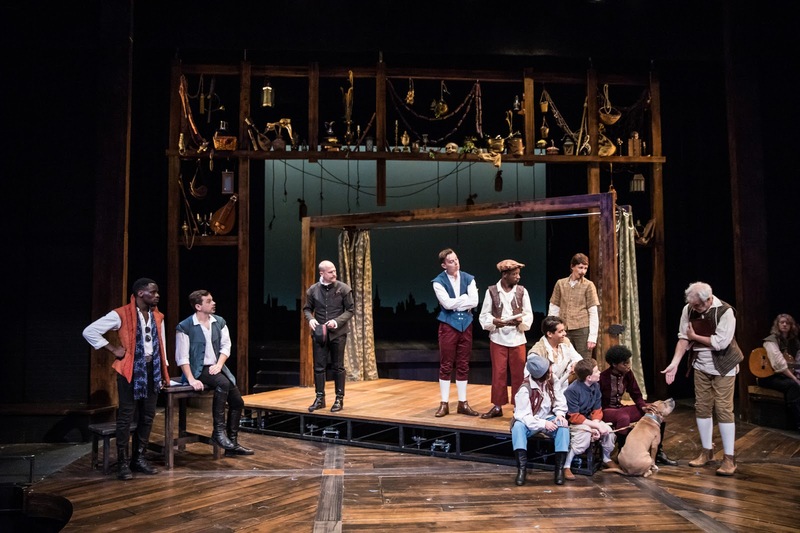 The company of 16 actors (plus Artistic Director Doug Scholz-Carlson, some musicians, kids, and a dog) play all the roles, some actors in as many as three plays. Plays run Tuesdays through Sundays, with two-show days on Wednesday, Friday, and Saturday. Of the plays that I saw, all deal with relationships and power dynamics, and because of the discussions about intimacy on stage, I viewed all of them with new eyes (as I will every play with intimacy going forward). Two of the plays were fun light comedies, one was a pretty intense two-person drama, and actually only one was written by the bard. Here are a few thoughts on the plays, in the order I saw them. As the one new play set in modern times, the two-person 2012 Tony nominated play may seem like an odd choice for a Shakespeare festival, but as you experience it along with the other plays it begins to make sense. 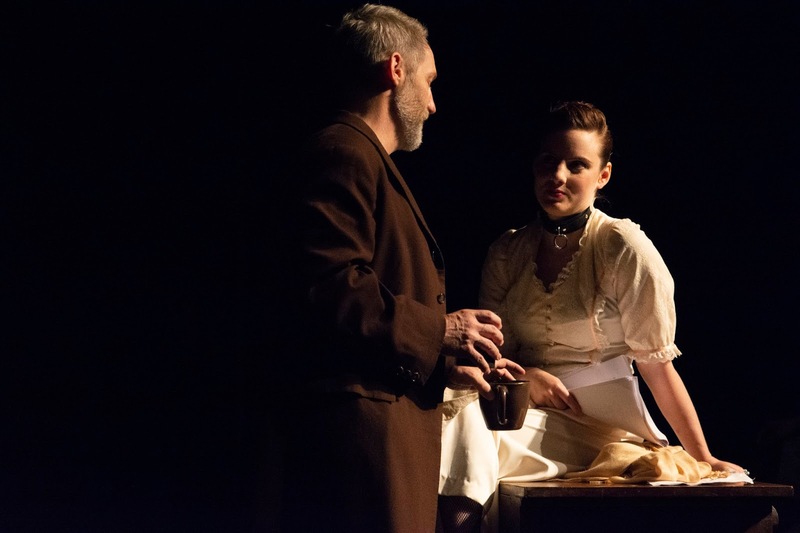 This play about a play about a book has scenes within it set in the late 19th Century, so it's sort of a period piece set within a modern piece. The play-within-a-play is also a common theme in the festival, which means that it speaks about theater itself, and with its themes of gender relations and power dynamics, really fits with the stage intimacy conversation that was happening last weekend. Anna Sundberg (former #TCTheater artist now based in NYC) reprises her role from the 2013 production at the Jungle, this time with scene partner Doug Scholz-Carlson, both of whom give strong yet vulnerable performances. The story takes place in real time in a NYC audition room, with a playwright auditioning an actor for a role in his adaptation of the novel Venus in Furs by German author Leopold von Sacher-Masoch, after whom the term masochism was coined (which may give you an idea of the plot). There are two levels of story going on here - the playwright and actor, and the couple in the novel - and scenes flow back and forth between the two realities until they almost merge into one. The power dynamic between the two characters switches back and forth throughout the 90 minute conversation, but it becomes obvious by the end of the play that this actor has some things to say and some points to make about women in theater and literature, which are very relevant to today's conversations. Although it's based on a movie (that I saw but barely remember), Shakespeare in Love feels like it was meant for the stage. I can't help but wish that Stoppard (one of my favorite playwrights) had adapted it himself, and I have some issues with the ending, but on the whole it's a dynamic and delightful story about love and the theater. And a (fictional) story about the namesake of the festival seems an entirely appropriate choice, and lets us at least imagine a little what this Will whose picture is all over the Winona State campus might have been like. In brief, Shakespeare in Love is a fictionalized account of the writing of Romeo and Juliet, with Will working against writers block, quarreling producers, and money troubles (it's hard to be the bard). Viola is a theater-lover and would-be actor at a time when it's illegal for women to appear onstage, so she disguises herself as a man to win a role in her idol Shakespeare's new play. Needless to say they fall in love, with many details of their courtship mimicking that of Romeo and Juliet's story, except in this case Will and Viola came first. The play is dynamically staged with constant movement, exciting fight scenes, and nary a dull moment, even scene changes are accomplished fluidly without pause. A rotating mini stage allows for quick transitions between locations, many of which are onstage at the theater, with clever use of hinted at action behind the curtain. This is the only play I saw in which the entire 16-person company appears, and they're a fantastic ensemble, all of them so fun to watch, led by a charming Christopher Peltier as Will, a much lighter Anna Sundberg than the previous show as Viola, and Benjamin Boucvalt as Will's frenemy that you can't help but root for. Add in a four-person ensemble playing Shakespearean era music to accompany the action, and it's a completely delightful evening. 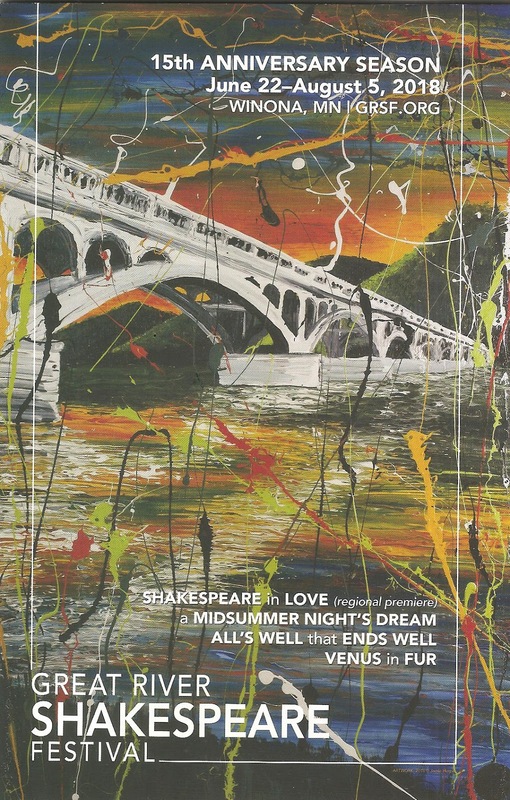 I think Midsummer has officially become my favorite Shakespeare play. I've seen it a lot (this is my 6th time), which for me and Shakespeare is actually a good thing. It means that I already know the story, so I can just sit back and enjoy the storytelling, and there's some great storytelling here. A Midsummer Night's Dream is never not fun (well, it shouldn't be anyway), but this production is particularly fun and playful. Just eight actors play twice or more as many characters; they're in and out of the audience, playful with those in the front, with a bit of audience participation in a fun and innovative way. There's lots of magic on stage (as there should be in Midsummer), both in the design and in the movement of the actors, with costumes that are modern with a touch of magic as well (designed by Rebecca Bernstein, who also designed the costumes for Shakespeare in Love). The extremely charming young lovers (Anique Clements, Antonio Duke, Leah Gabriel, and Silas Sellnow) also play the rude mechanicals, the theater troupe puttin' on a show for the Duke. Silas also transforms into Hippolyta's donkey love, when his trucker cap is removed and replaced with a long-billed cap representing a donkey snout. 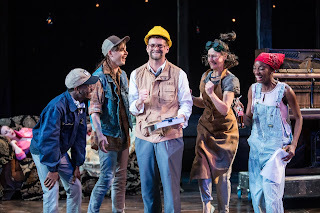 Zach Curtis (#TCTheater favorite who recently moved to South Dakota as the Artistic Director of Black Hills Community Theatre) is a different kind of Puck than I've seen before, less spry and sprightly and more devilishly powerful. He controls the mere mortals, as well as the lights and the thunder and whatever else he wishes to manipulate, with a snap of his fingers or a wave of his hands, like the ringmaster of this great circus. Benjamin Boucvalt and Anna Sundberg are both the royal and fairy rulers, while Andrew Carlson plays multiple characters including the funny and awkward director of the rude mechanicals. This tight ensemble really brings out all of the fun in the play, with some clever quick changes, which makes it even more theatrical than a large ensemble could. In a way, Midsummer is about the magic of theater, and the perfect end to a magical theater weekend. 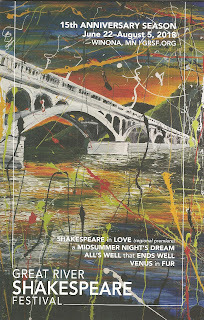 If you're looking for a fun vacation in a charming Minnesota town not too far away with lots to do, see, explore, eat, and experience, including some great theater, I highly recommend a visit to the Great River Shakespeare Festival in Winona. You can find the calendar of shows and events, along with information about tickets, lodging, dining, and area activities on the GRSF website. I stayed at the AmericInn which is perfectly pleasant but not a walkable distance at about three miles away from the Winona State campus where the festival is held. Next time I go I might check out B&Bs or AirBnBs near campus so that I can walk to all of the activities. Unfortunately my visit was so short I did not have time to explore much of Winona between theatering, but next time I'll plan a longer stay so I can visit the art museum and maybe take a hike in the hills above town. As they say in the ads I hear every time I start my MPR app: "Visit Winona: offering Shakespeare to bike trails, Picasso to donuts. Winona Minnesota is a crossroads for a surprisingly weird assortment of entertainment. Information about things to do is at VisitWinona.com."